It's time for another Phone-A-Friend update! These Phone-A-Friends are hands down one of our favorite things on da blog. We love hearing everything you are up to! And get ready for another kid's room on its way to the blog soon! When I saw today's Phone-a-Friend, I realized... I owe you a shades update! I've been greedily benefiting from your advice for a few weeks now without filling you in! I'm sure you are shocked to hear that with a little shopping, things quickly got a little out of control, but in the end I lucked out BIG TIME! So I hit the world wide web and was about to click purchase on the TOMS wayfarers. They were on back order so I took a quick pause (hello ADD and Facebook) and saw Blythe's emergency update about Warby Parker launching a sunglasses line of ALL polarized lenses for $95. Since sunglasses were new at Warby they also had a bit of a back order, but they won me over with their price (I didn't want to make the entire decision on price, but dontcha just love a bargain!) and their amazing free shipping which meant I could order a bunch o' pairs and then decide. I ordered six pairs from Warby and waited for my fancy/expensive/polarized to arrive at my doorstep. In the meantime I hit the streets on the hunt for my trendy and fun, yet inexpensive pairs. I looked high and low for coral, because I loved the color and style, but couldn't get my hands on coral anywhere... What I did end up with were a beige pair with a fun shape and more fun-kay look (Forever 21 - $5.90) and a large fun shaped pair that are tortoise on the front and pink on the sides... My second pair were a steal! I found them at Marshalls, they are Betsey Johnson, are 100% UV protection and were a mere $14. Then... my Warby's arrived - well some of them anyway. It's a long story, but thanks to their AMAZING customer service and my patience (basically with their launch of the line they had overextended themselves and I had to wait longer than expected), I ended up with three pairs for the price of ONE! That's right ladies - 3 pairs of polarized lenses for $95 (these, these and these)! It was going to be a hard choice for me, to pick just one pair (story of my life - can't choose!) and you can imagine how thrilled I was to not have to! 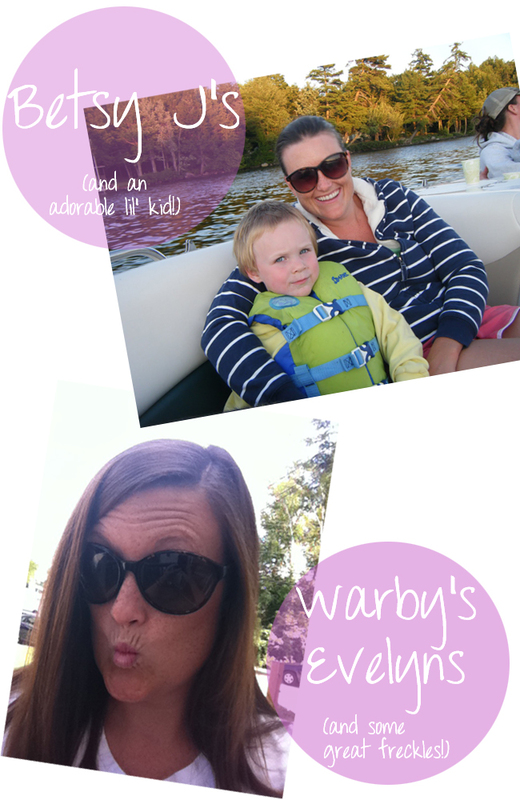 Moral of the story - I'm Warby's #1 fan. Oh and they send a hard case with each pair - so they include responsibility tools in their price! Long story longer... Thanks to you two and your amazing advice, I've got 6 pairs of SUPAH shades to choose from every time I leave the house! Good thing since I literally feel the need to wear sunglasses in a light rain. I cannot thank you ladies enough! You are the best(ies)! Lori, you are adorable and we love you! Incredible finds and you can basically open up a sunglasses hut out of your house at this point. 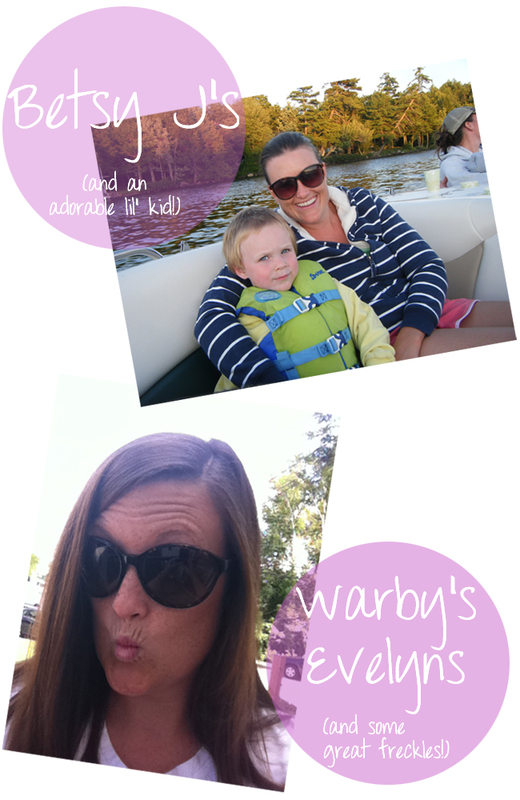 Inspired by you, Blythe's thinking of making her second Warby purchase a sunglass one: Tenley's in blue. Oh-la-la! Ladies - this is one of my favorite snarky celeb sites....all about sunglasses and the celebs that wear them. If you can get past the horrible design, it's pretty funny. http://www.celebrity-sunglasses-finder.com/ ps - nice choices Lori.